NEW HAVEN — Dozens of students dressed in black staged a sit-in at Yale Law School on Monday to protest the nomination of Judge Brett Kavanaugh to the Supreme Court and demand an investigation into sexual misconduct allegations against him. Organizers said allegations of sexual assault and harassment should be taken seriously, and Kavanaugh poses a ‘‘real threat’’ to the country. Other Yale students traveled to Washington to protest Kavanaugh’s nomination on Monday. 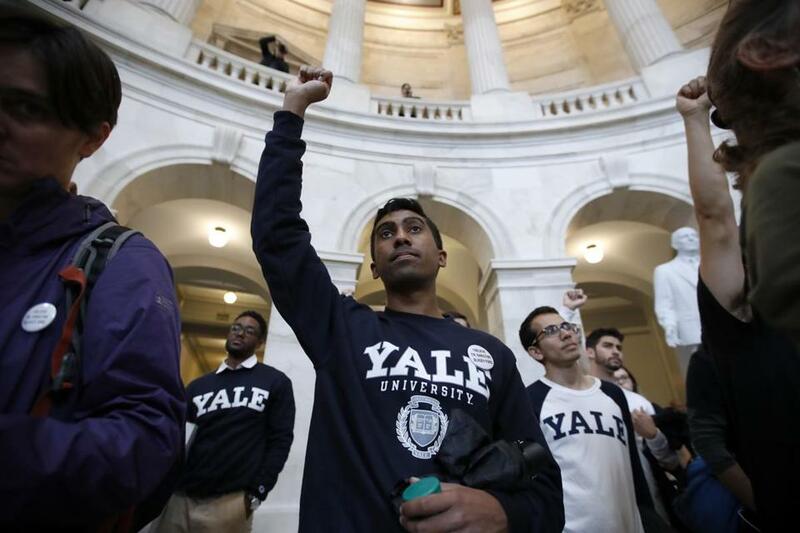 Yale student Jishian Ravinthiran, center, raised his fist during a protest against Brett Kavanaugh on Capitol Hill on Monday. The sit-in came the morning after new allegations against Kavanaugh were reported by The New Yorker, which published an account by a woman, Deborah Ramirez, who alleged Kavanaugh exposed himself to her during a drunken dorm party when they were students at Yale during the 1983-84 academic year. Another woman, Christine Blasey Ford, is accusing Kavanaugh of sexually assaulting her at a party when they were teenagers. Both Kavanaugh and Ford will testify before the Senate Judiciary Committee on Thursday. Some Yale faculty members cancelled or rescheduled law classes Monday to accommodate the protest. Gerken said 50 faculty members have signed a letter to the Senate Judiciary Committee urging a ‘‘fair and deliberate’’ confirmation process. The law school had issued a press release about Kavanaugh’s nomination in July, with Gerken and other faculty members praising his work. But Yale Law School spokeswoman Janet Conroy told the Yale Daily News the press release was not an endorsement of the nomination. Senator Richard Blumenthal, a member of the Senate Judiciary Committee and a Yale Law School graduate, was at the law school protest Monday. ‘‘The United States Senate cannot in good conscience vote on this nomination without a full, fair FBI investigation, and without an opportunity for these sexual assault survivors to be heard,’’ the Connecticut Democrat said.